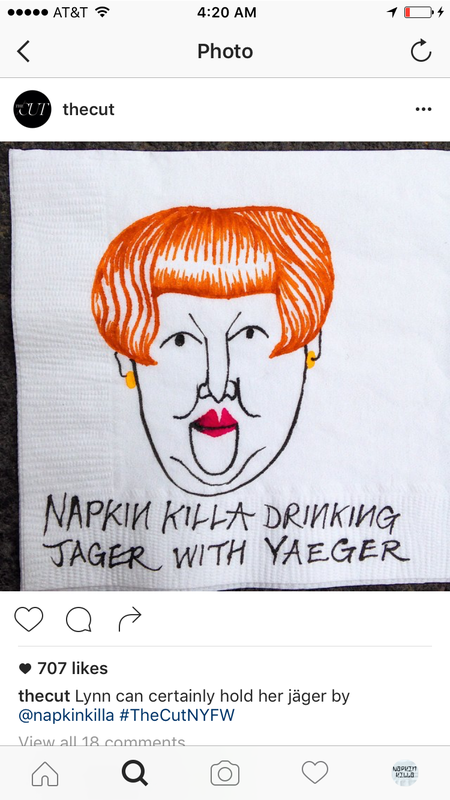 New York Magazine's fashion vertical, The Cut found Killa on the gram and contracted the visual hitman to document New York Fashion Week (Sep. 2014) on his familiar canvas - napkins. 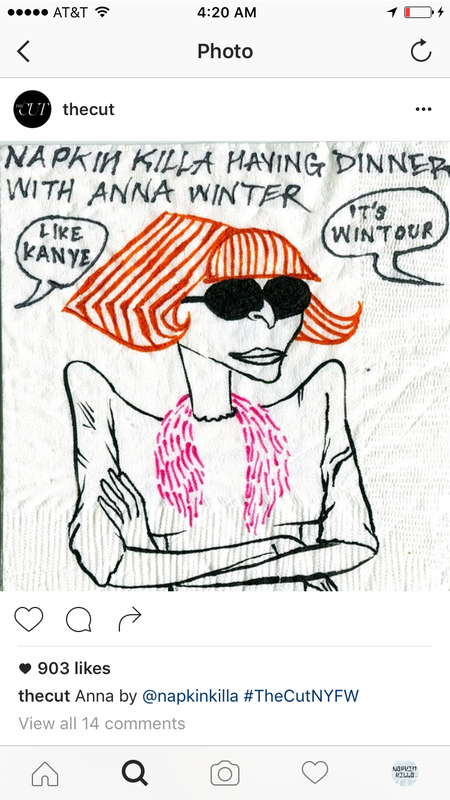 NK drew fashion icons, street stylers, runway models at shows & party goers throughout that week. 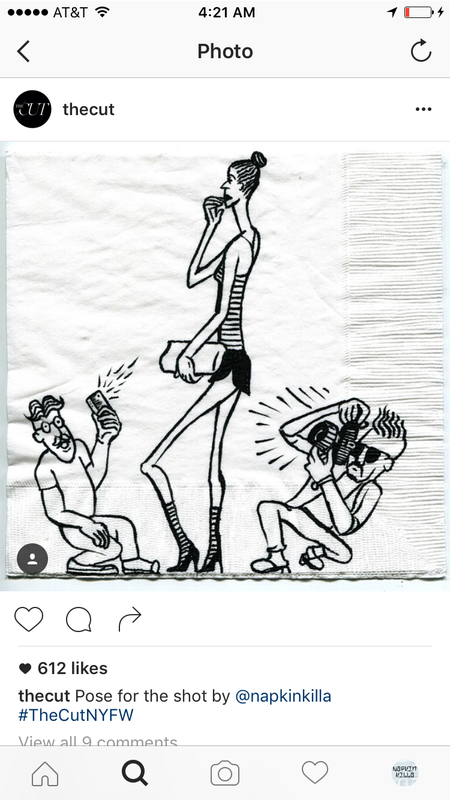 The fashion assassinations gained a lot of attention. 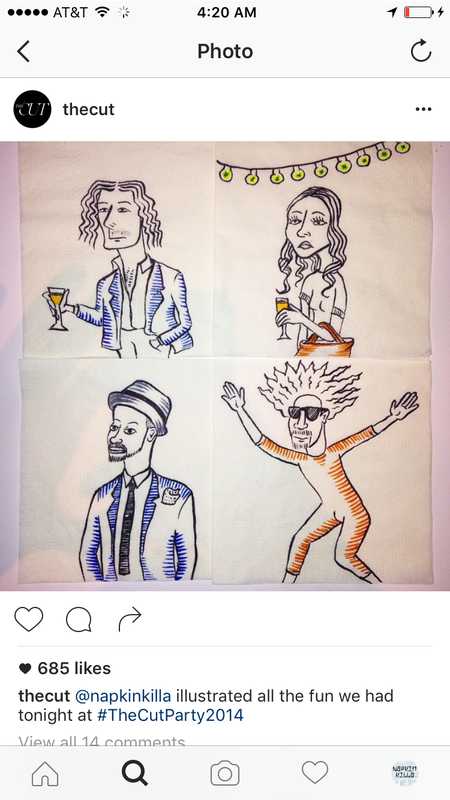 "Fashion Week, Captured on Napkins"
Napkin Killa became, like, the new hot thing for fashion parties. All the big brands came knocking at Killa's door. It became a regular thing for Nappy to be surrounded by models, arguing over whose turn it was to get drawn. 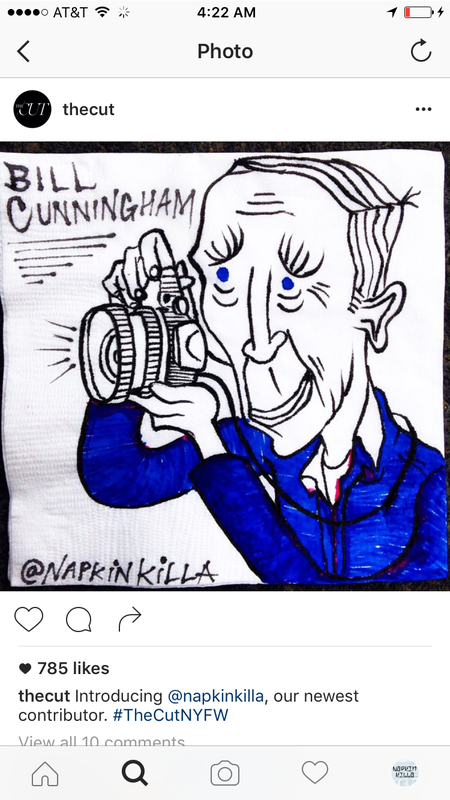 It's Napkin Killa, ya favorite supermodel's favorite (napkin) artist. 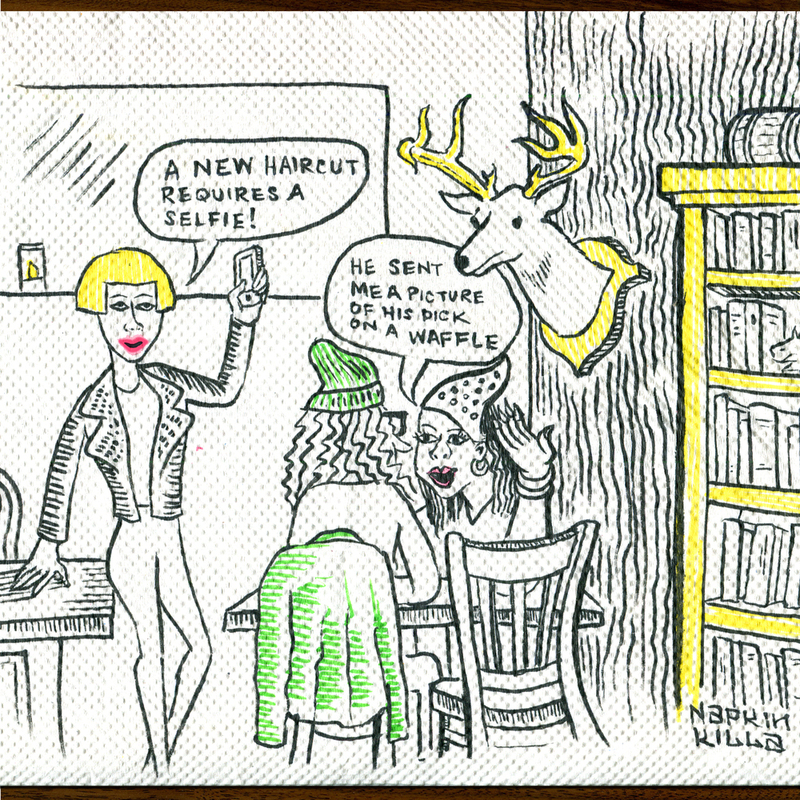 Originally from Los Angeles, Ca. Currently based in Bushwick, Brooklyn, NYC. 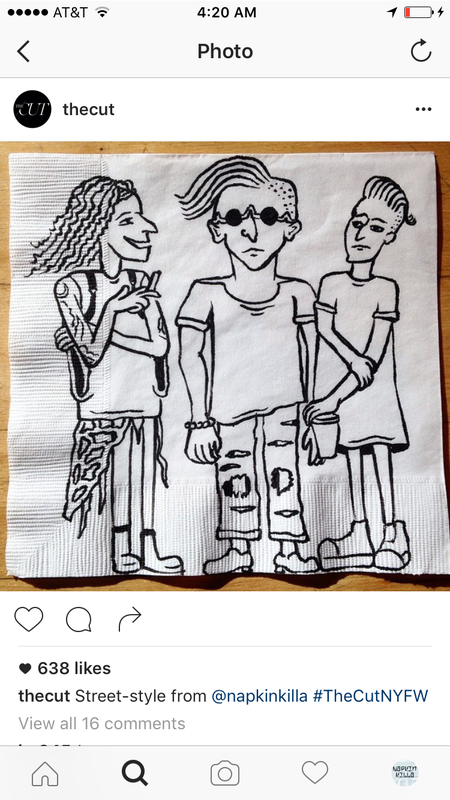 Though Killa travels all over the world to do his napkin thang. Here are some cities Killa got flown out to draw at events. Killa even made an appearance on live television for MLB Network (Major League Baseball's dedicated channel). On the 2015 trade deadline, the hosts of MLB Central had Nappy drawing players on baseballs with their new team hats. Some of the illustrated trade projections even came true. 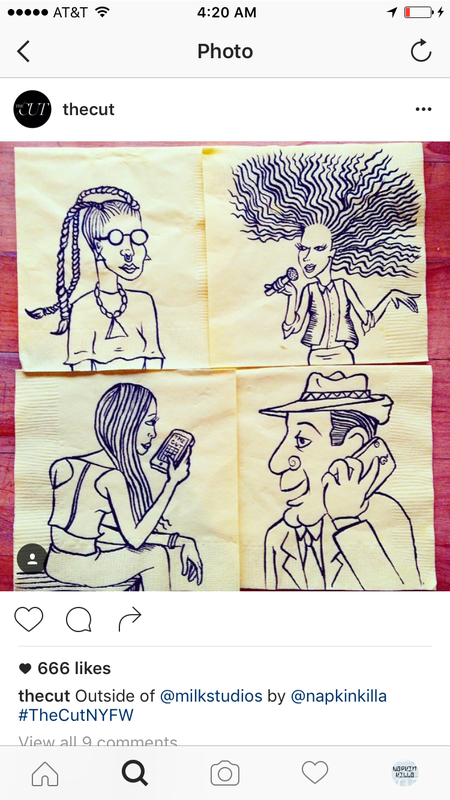 In June 2015, local non-profit #SaveArtspace selected a drawing by Killa to be put up on a 20 ft. billboard in Bushwick during Bushwick Open Studios. The billboard is still up and located at Morgan ave. & Johnson ave. Photography by Sadé Clacken-Joseph, Atisha Paulson, Madeline Zieckler, Danny Dwyer, & Mike Coppola.